for whatever reason, fasting makes me want to try new recipes. i know, it makes NO sense whatsoever, but it's true. i think it's mostly because i try out recipes that i wouldn't really want to eat. i tend to cater more towards the hubs taste buds, or the treat him with 'less' healthy dishes. he favors savory, and doesn't do sweet dishes, like say... this hawaiian pineapple chicken dish i keep wanting to try. the dude usually won't eat any vegetables & slathers his meat with ketchup, mustard, or ranch dressing. makes dinner time LOTS of fun. i wanted to find something quick for dinner last night..
& that i had all the ingredients already on hand for. & decided to give it a try. i knew it wouldn't disappoint. 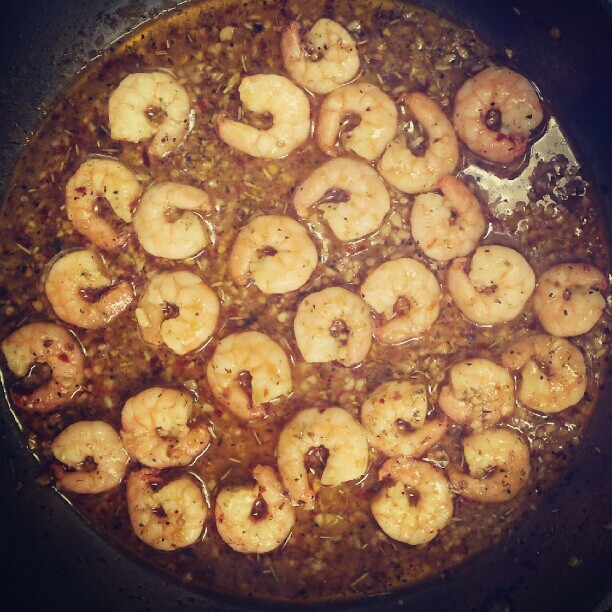 rice, shrimp, garlic, butter, rosemary, oregano, red pepper flakes, paprika, salt, whole peppercorns, beer & chicken broth. all ingredients i typically have on hand. although this time i didn't have rosemary or paprika, but a tone's pre-mix of rosemary & garlic, that had paprika in it.... so i nixed the paprika & just added the amount called for of rosemary. i didn't really READ the part on budget bytes where it stated this was a spicy recipe... and i didn't think about the fact i was adding a teaspoon of red pepper flakes.. but it didn't really matter, because, like i said.. i'm fasting/juicing..
about 1/2 through his bowl the hubs was sighing & wiping his brow..
he said it was SPICY. said it was full of flavor, and definitely got a thumbs up on the possibility of a repeat performance..
if you haven't checked out 'budget bytes', you totally should. she has some really great inexpensive meals on her blog. she prices out each ingredient for you & how much each serving is, as well as the total meal. any good food blogs you frequent?